A big part of what NJBIA does is advocating for workforce development policies, particularly those aimed at preparing students for entering the workforce or starting their own business. Last Friday, NJBIA staff did more than just advocate; they put workforce development into practice by participating in a daylong skills-building session with about two dozen students from Trenton High School. 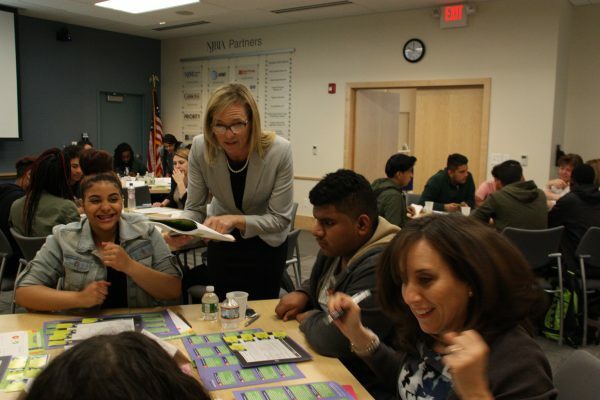 Under the guidance of Junior Achievement of New Jersey (JANJ), NJBIA staff led students through a series of exercises designed to develop their problem-solving skills as well as the soft skills, such as how they present themselves to potential employers and how they handle customers. 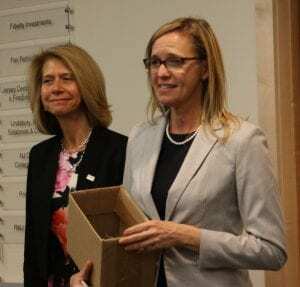 The program was developed jointly by JANJ and NJBIA, and is now used across the state, according to Christy Tighe, JANJ’s director of College & Career Readiness. Last Friday, NJBIA staff did more than just advocate; they put workforce development into practice by participating in a day-long skills-building session with about two dozen students from Trenton High School. Under the guidance of Junior Achievement of New Jersey (JANJ), NJBIA staff led students through a series of exercises designed to develop their problem-solving skills as well as the soft skills, such as how they present themselves to potential employers and how they handle customers. The one-day workshop was piloted jointly by JANJ and NJBIA, and is now used across the state, according to Christy Tighe, JANJ’s director of College & Career Readiness, pointing to a Business Outlook Survey that indicated a lack of crucial employability skills among entry-level employees in New Jersey. During the program, students were presented with real-world business scenarios, such as a dealing with a customer at a fast food restaurant adding several special requests to her order or being overstocked with a particular game at their video game store. Unlike many classroom lessons where answers are right or wrong, these sessions stress that there will be consequences no matter what the students do. Students learn that when it comes to the problems they will face at work, understanding the consequences of their actions is key to making smart decisions. In other exercises, students used role-playing to learn about conflict management, and developed a sense of collaboration and team work by building a structure as a group using only index cards and paper clips. The program also taught the kids about planning for careers with exercises on what’s involved with various professions, and what they have to do to develop the skills to achieve their goals. Throughout the day, NJBIA employees served as mentors to the students, coaching them through the activities and sharing their own stories and career advice. Siekerka reminded students that today was about learning skills that can be applied to everyday situations. JANJ is looking for volunteer role models to serve as mentors at their upcoming workshops, which are held on college campuses and corporate facilities. For more information, please contact Christy Tighe, Director of College and Career Readiness, at ctighe@ja.org. Thank you for putting this program together to prepare our young students to think about their future. The more exposure our students have in thinking about careers and employment options and skills, the better prepared they will be.